You don’t have to be a master gardener to create a cascading arrangement, thanks to our easy peasy, stackable planters! 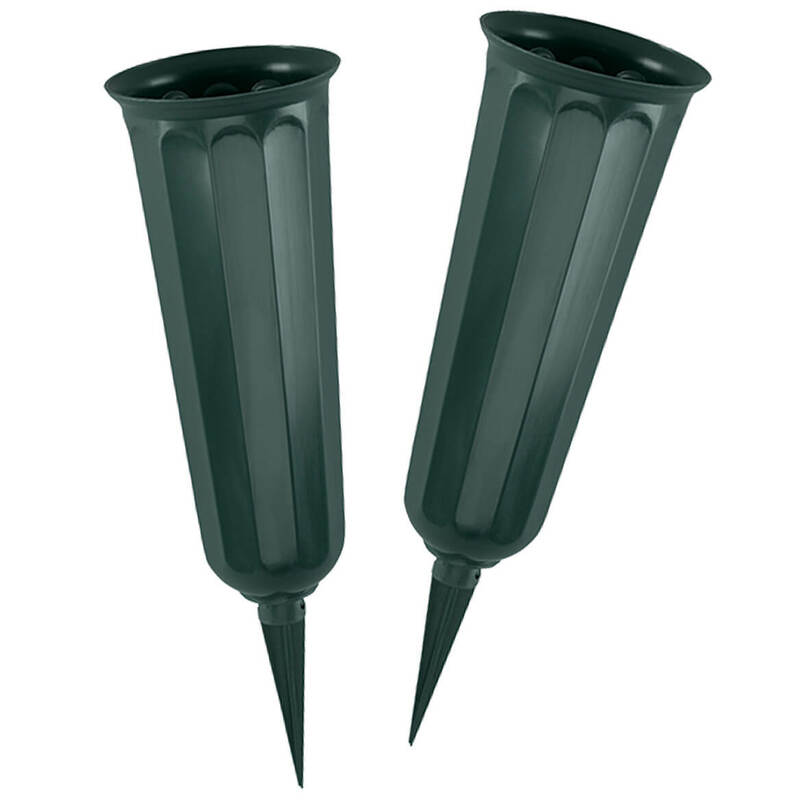 Each plastic planter features three separate 5 1/4″ diameter sections with drainage holes. Simply add combinations of flowers or herbs in these stacking planters for dramatic, towering display—utilizing vertical space on terraces, balconies, patios or porches. 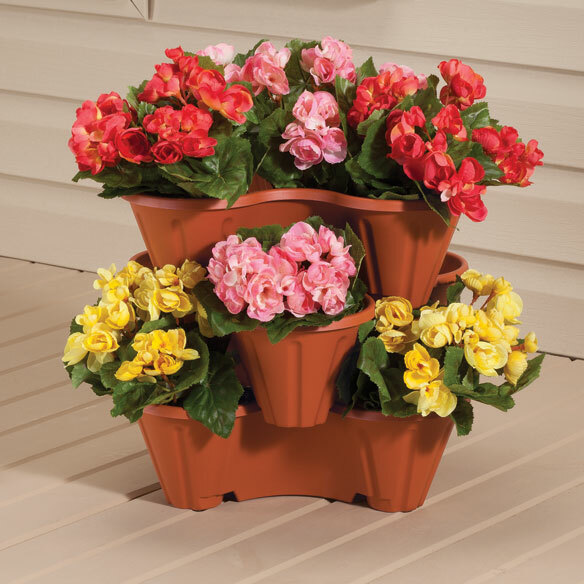 Each durable plastic flower planter can also be displayed on its own. Flowers not included. Set of 3. Each 12 1/4″ long x 12 1/4″ wide x 4 3/4″ high. This trio of classic beauties adds instant charm to a lawn or garden, accommodating your favorite flowers or plants. 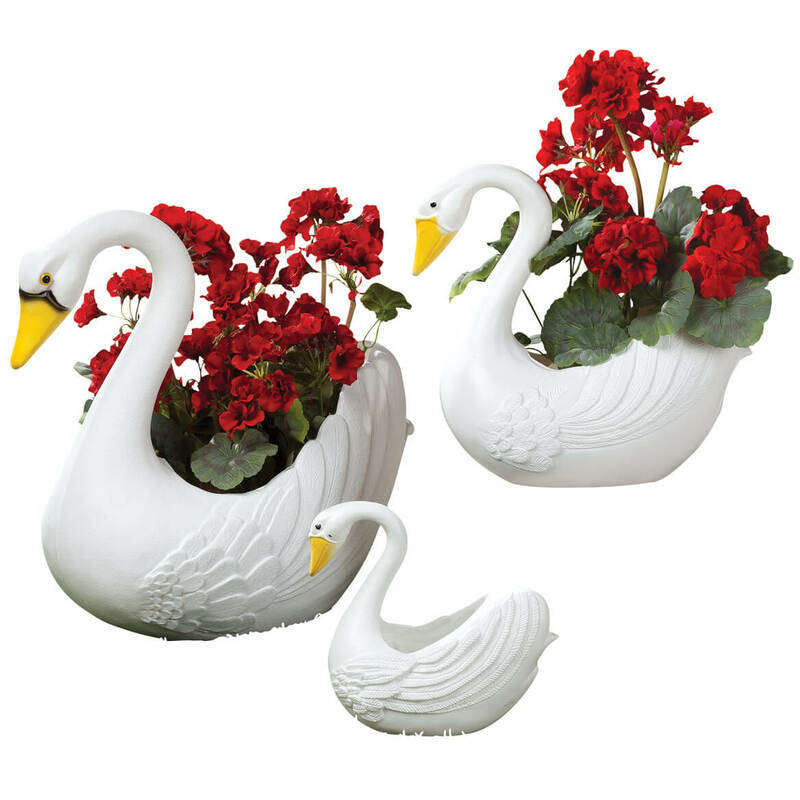 These swan planters are designed in sturdy molded polyethylene with curved necks, colorful beaks and eyes, plus detailed “feathers.” This plastic swan planters set includes small (7 1/2″ long x 3 1/2″ wide x 8″ high ), medium (10 1/2″ long x 6″ wide x 11″ high ), and large (15″ long x 8″ wide x 16″ high). No express shipping. Slip an ordinary flower pot inside this handsome tan chippendale planter box for spectacular display! 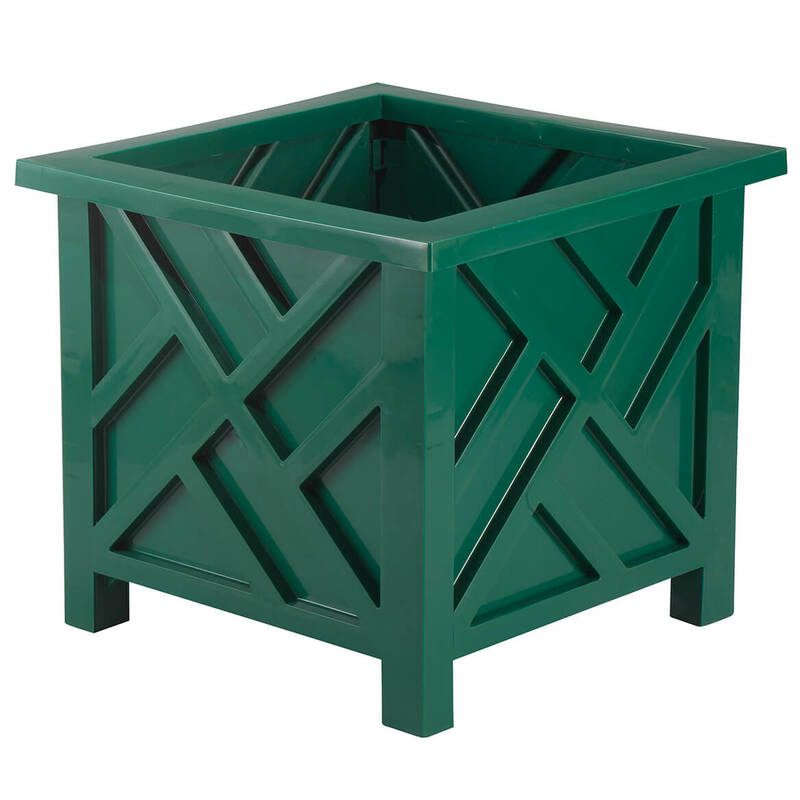 A stunning showcase for flowers or topiaries, this outdoor planter is crafted of durable polypropylene with traditional Chippendale-style lattice pattern. Snaps together without tools; snaps apart for storage. 14 3/4″ sq. x 13 1/4″ high; 11 1/2″ sq. x 11″ high interior. Slip an ordinary flowerpot inside this handsome terra cotta chippendale planter box for spectacular display! 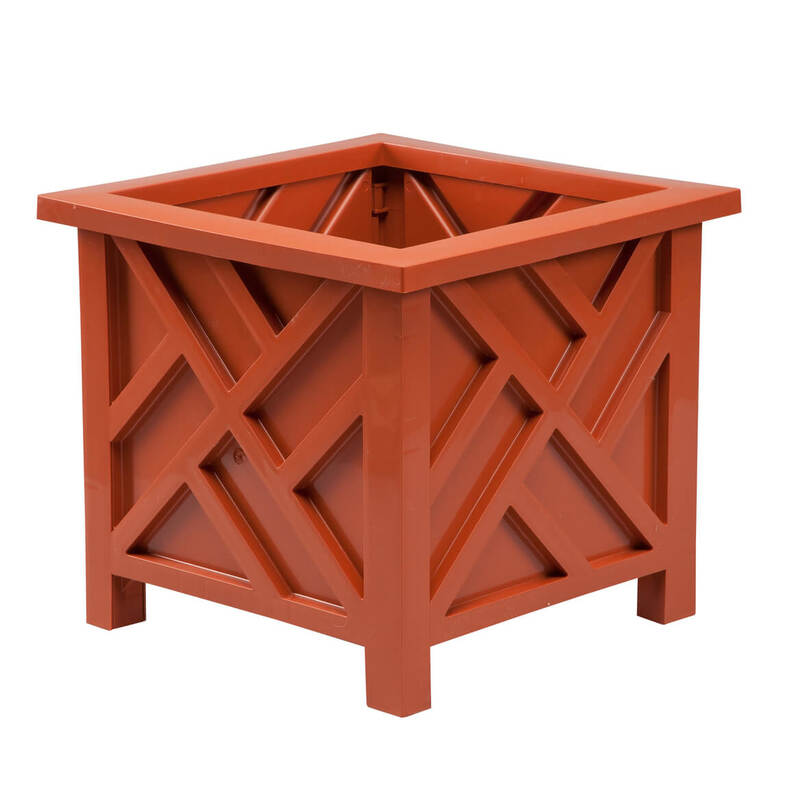 A stunning showcase for flowers or topiaries, this outdoor planter from Miles Kimball is crafted of durable, terra cotta-colored polypropylene with traditional Chippendale-style lattice pattern. Snaps together without tools; snaps apart for storage. 14 3/4″sq. x 13 1/4″ high; 11 1/2″sq. x 11″ high interior. Slip an ordinary flower pot inside this handsome chippendale planter box for spectacular display! 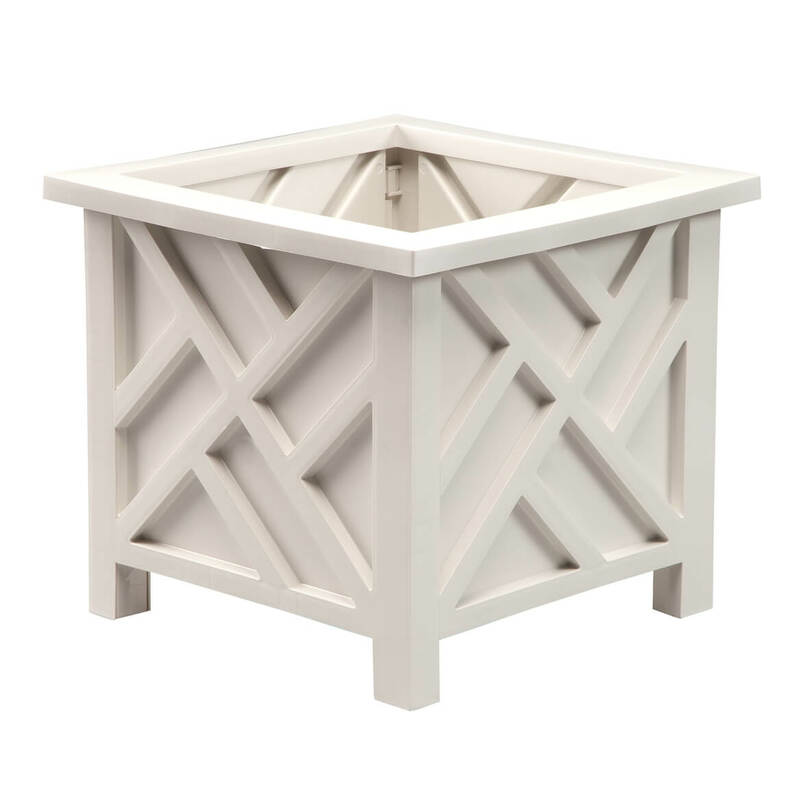 A stunning showcase for flowers or topiaries, this outdoor planter from Miles Kimball is crafted of durable, white polypropylene with traditional Chippendale-style lattice pattern. Snaps together without tools; snaps apart for storage. 14 3/4″sq. x 13 1/4″ high; 11 1/2″sq. x 11″ high interior. 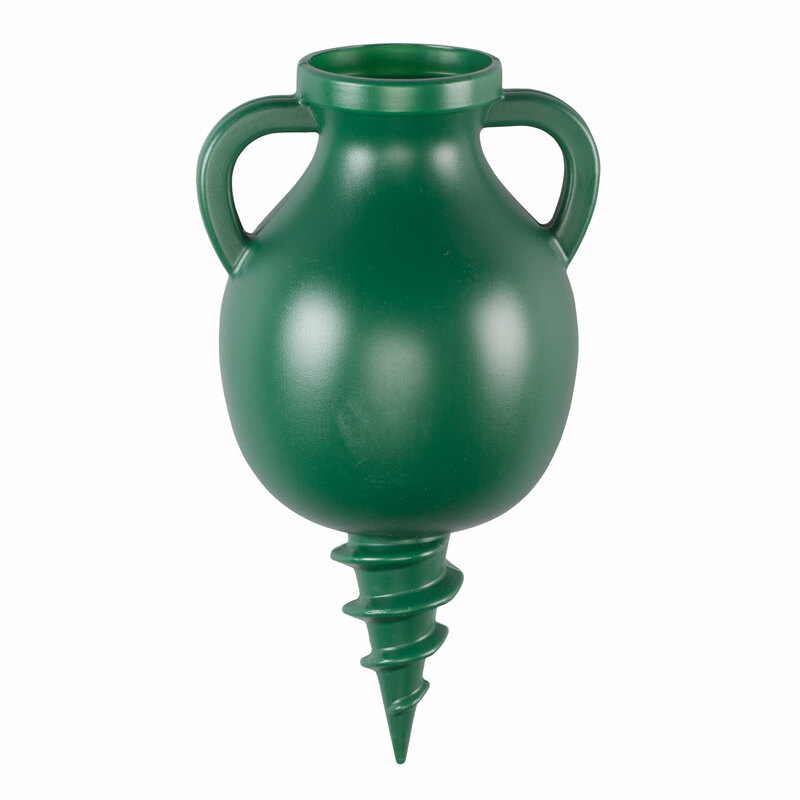 This classic garden cemetery vase stakes securely in the ground—making it easy to create a beautiful memorial arrangement at the cemetery, or right in your own garden. Simply fill the garden vase with seasonal flowers or greenery (not included) and anchor its attached spiral stake securely into softened ground for quick, stable placement. Memorial vase constructed of durable, molded plastic. 10″ long x 5″ wide x 6 1/2″ high vase; 3 1/2″ long stake. Slip an ordinary flower pot inside this handsome green chippendale planter box for spectacular display! 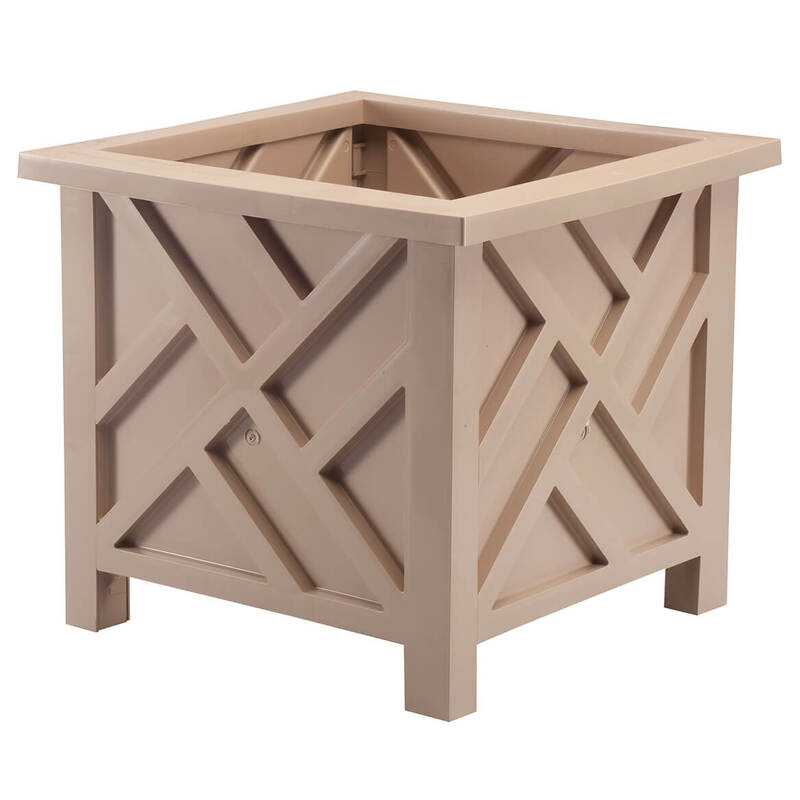 A stunning showcase for flowers or topiaries, this outdoor planter is crafted of durable polypropylene with traditional Chippendale-style lattice pattern. Snaps together without tools; snaps apart for storage. 14 3/4″ sq. x 13 1/4″ high; 11 1/2″ sq. x 11″ high interior. Turn an ordinary downspout or pole into a glorious floral display with these clever, wrap-around downspout/pole planters! 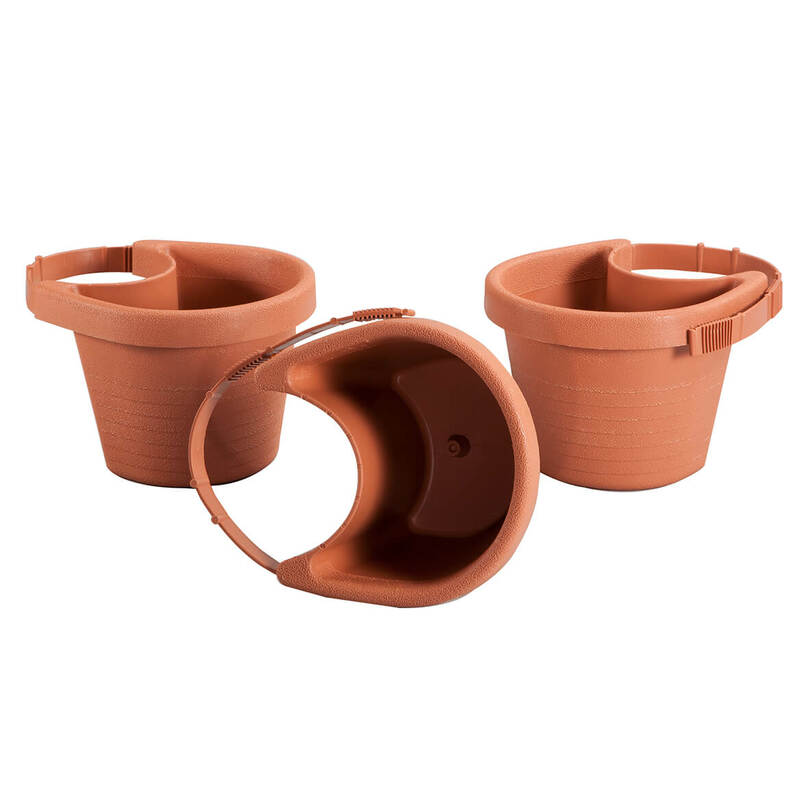 Designed with an adjustable strap that wraps around most downspouts or poles, the terracotta colored outdoor planters are designed in durable, weatherproof plastic. Making it easy to create your own colorful flower show, the trough planters can be displayed together or apart. Set of 3. Each, 4 3/4″ high x 6″ dia. Detailed cemetery vases make perfect additions to memeorials year-round. Weather-resistant with 3″ high ground stakes included to lock in place for easy placement and stability. Set of 2; each 3″ dia. x 7″ high. Durable plastic. 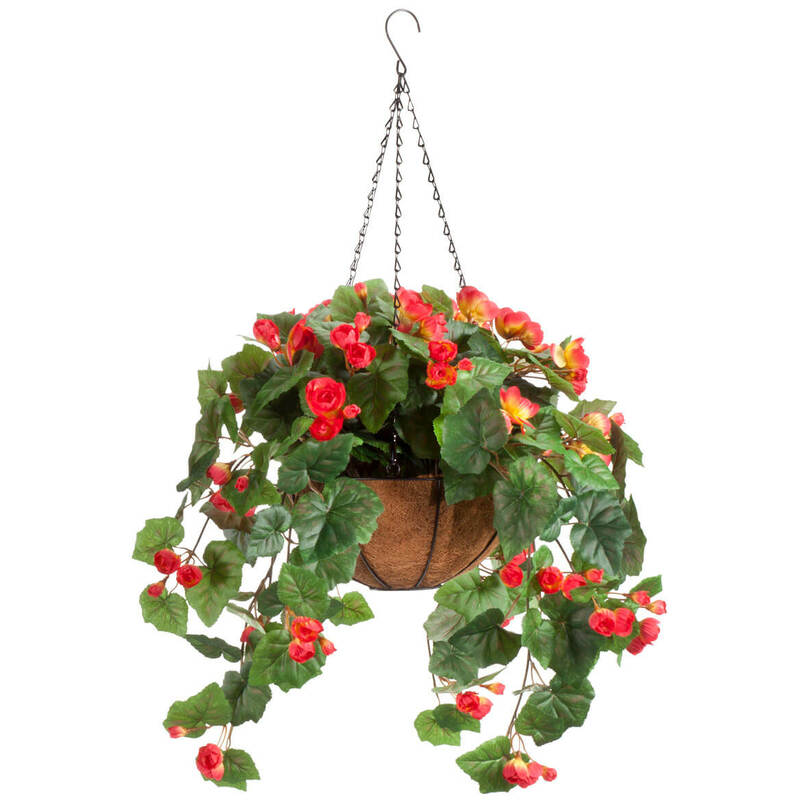 Enjoy instant color and carefree curb appeal loaded with full, lifelike flowers and lush, hanging foliage. Includes 10″dia. metal basket with coco fiber liner, 18″L chain with 3 polyester, plastic and wire stems. Specify color code. For indoor or outdoor use.